One of the most important things all business owners ought to know are your website visitor statistics. Quick check: Do you know how many visitors are you getting to your website every month? Are they in the hundreds, or thousands? Which countries are your visitors from – Singapore, Malaysia, or even the United States? Do you know which channels are contributing most of the traffic for your website? Are your visitors mostly coming from search engines, social media or are they referred from other people’s websites? All this information is important because as the saying goes – “you can only improve on things that you can measure”. In this post, let me share with you how you can find out all this important information about your website so that you can be empowered with the knowledge to make better decisions for your website and business! First things first, you need to have Google Analytics on your website before you can start tracking information about your website traffic. 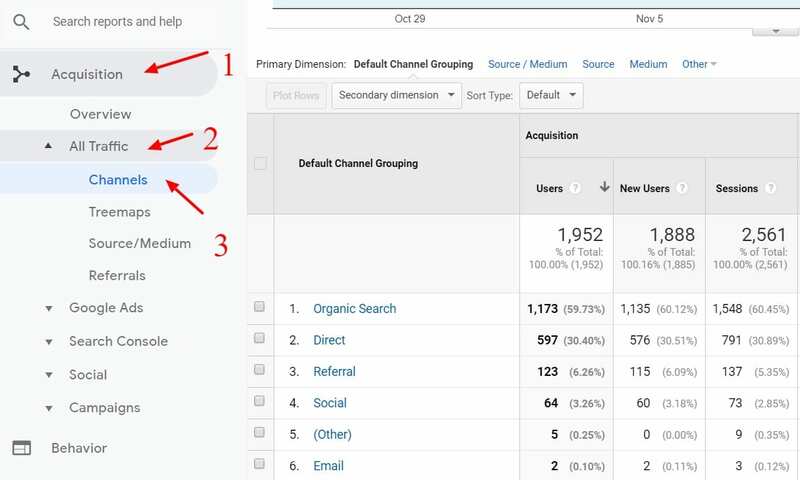 Once you have enabled Google Analytics on your website for at least two to three weeks, you are now ready to login to your Google Analytics account to view your website statistics! Are you looking at your website from the eyes of your visitors? How do your visitors get to know your website? Which web pages do your visitors view most? 1) Where Are Your Visitors Coming From? The first and foremost important thing you need to find out from your Google Analytics data is whether your website is currently attracting the right audience. Using a simple example to illustrate – if you have a website that is selling water purifiers to the Singapore market only, you’d want to make sure that most of your website visitors are coming from Singapore! 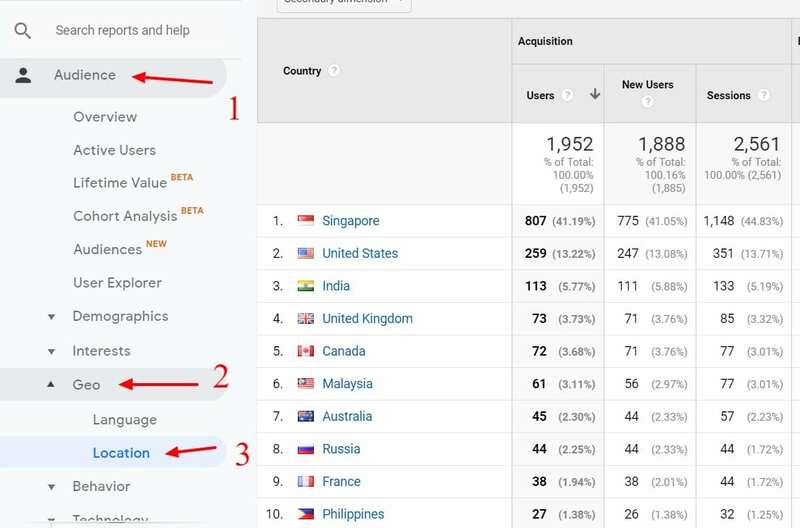 How to check in Google Analytics: To see what countries your visitors come from, log in to your Google Analytics dashboard and go to Audience –> Geo –> Location in the left navigation. From the above screenshot, you’ll see that less than half of its traffic (only 41.19%) is coming from Singapore and the rest (58.81%) is actually coming from outside of Singapore (mainly United States, India, United Kingdom, Canada and Malaysia). If your website is targeting the international market, then there is no issue. But if the website is supposed to be targeting the Singapore market only, you now know that you have not maximized your website’s potential to reach the right audience and you’ll need to further investigate the sources of your website traffic. Knowing where your visitors are coming from can also help you to identify potential overseas markets for expansion. For example, if you find that your website has a consistent inflow of visitors from Japan, you can consider adding Japanese as a secondary language to your website so that you improve user experience for your Japanese visitors and in turn boost conversion (if you are providing your products/services to the Japanese market). 2) Are You Looking At Your Website From The Eyes of Your Visitors? The next important thing you need to find out is what type of device do your visitors mostly use to browse your website – is it desktop, tablet or mobile phone? And what type of browser do they use to view your website? The reason you need to know this is so that you can personally check your website to make sure that it is showing up correctly on the most commonly used devices and browsers. You’ll be surprised that many business owners do not even know that their website has problems displaying on Google Chrome which happens to be the most popular web browser nowadays! 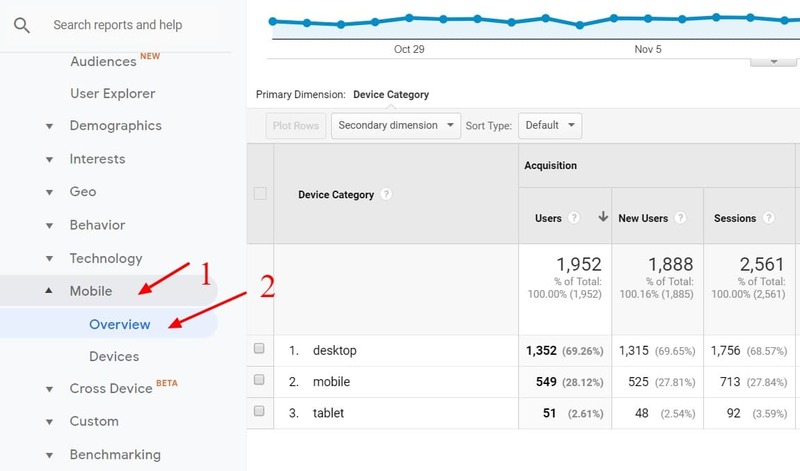 How to check in Google Analytics: To see the type of device your visitors use to view your website, go to Audience (same as above) –> Mobile –> Overview. On the Mobile Overview page, you’ll be able to see the device breakdown. Looking at the screenshot below, more than two thirds (69.26%) of the visitors for this website are viewing the website on desktop. 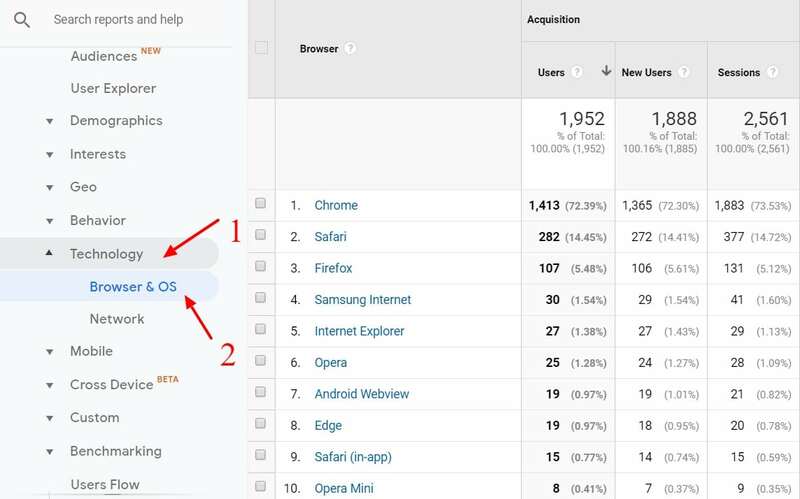 How to check in Google Analytics: To find out what type of browser your visitors use, go to Audience (same as above) –> Technology –> Browser & OS. From the screenshot below, it is clear that most of the visitors of this website are using the Google Chrome browser to view this site. If your website analytics data shows a similar trend as our examples above, then you should make it a priority to check your website on desktop using the Chrome browser to make sure that everything is loading fine and that the content is displaying normally. Of course, it would be best that you check your website on other browsers as well as on mobile phones if possible, so that all your visitors can enjoy a great browsing experience no matter what browser/device they are using. 3) How Do Your Visitors Get To Know Your Website? After knowing how many visitors you are getting every month and what browser/device they use to view your website, now you need to find out where they clicked on to land on your website – this is where you see if your marketing budget justifies. From the above screenshot, you’ll see that most of the website visitors came in through ‘organic search’ (59.73%), which means they had entered certain keywords in a search engine and clicked on the search results to land on this website. The second highest traffic source is ‘direct’, which means that 30.4% of the visitors had landed on this website by entering the website URL directly into their browser. This figure would also include visitors who had bookmarked this website earlier on and revisited it for a second time. ‘Referral’ is the third highest traffic source for this website, which means 6.26% of the visitors were referred or directed to this website from other people’s websites. You can click on the ‘referral’ link in your Google Analytics dashboard to reveal more details about the referrers. Personally I would advise against relying on just one traffic source for your website; always diversify your traffic sources. 4) Which Pages Do Your Visitors View Most? To start making improvements to your website, you first need to know which pages your visitors view most and start from there. Do you know which is the most popular page on your website (besides your home page)? On this page, you will see what are the top landing pages of your website, or in other words, the pages that are getting the most views. Just a quick note that most websites may have their home page as the top landing page but it is not necessarily true for all businesses. 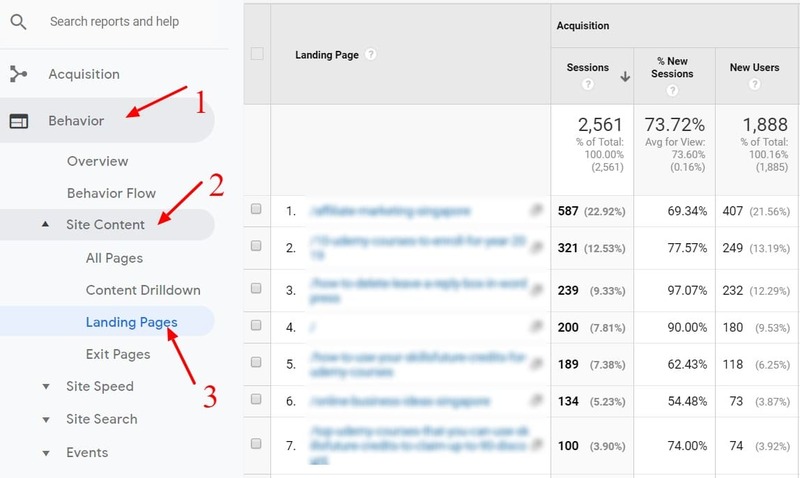 Once you identify the page that receives the most views from your visitors, you can now take a closer look at the page and make improvements from there. For instance, does your most visited page have an attractive call-to-action that leads your visitors to take desired actions? Depending on your business, a call-to-action can be a button that visitors can click to leave you a message through your contact form, or a link to encourage visitors to view your storefront details. It is extremely important to include call-to-actions on your website (especially on the pages that are most commonly viewed by your visitors) so as to boost conversion, so do take this suggestion into consideration! 5) Do You Track Your Conversions? This is something that most business owners don’t do because they simply don’t know how. Which traffic source referred you the most sales? Which page did your visitors view before they buy from you? Which is the last page that your potential buyer viewed before they exited your website? In Google Analytics, a conversion is referred to as a ‘goal completion’. As you can see from the screenshot below, this website has 74 goal completions (i.e. 74 contact form submissions in this example) and because you have tracked these form submissions, you are able to know which is the best performing traffic source for your business and you can choose to reinvest more of your budget in that channel. I hope that the information that I’ve shared in this post has helped you to gain a better understanding of how you can find out valuable data about your website visitors! Only after knowing these important information that you can start to think of improvements for your website and turn your website into an active marketing tool for your business! Do post your questions below if you have any!